You're looking at the face of Crom Dubh, The Crooked Dark One. Depending on which team you batted for in pre-Christian Ireland, he was either Lord of The Harvest or The Bringer of Famine. And a thousand years later, depending on whether you were a Christian convert or a stubborn adherent to the old gods, he was either a pagan wizard banished by holy St. Brendan or a dark and evil deity defeated by the sun god, Lugh. Across the millennia, his stone image was preserved in the village of Cloghane, at the foot of Mount Brandon here in Corca Dhuibhne. And each year people climbed the mountain from the east to celebrate his annual festival with bonfires, feasting, dancing, hand-fasting and sacrifice. Mount Brandon is Corca Dhuibhne's holy mountain. Brendan the Voyager, the medieval saint said to be the first European to reach the New World, began his epic voyage from Brandon Point at the north western end of the peninsula. Before setting out with his companion monks, he's said to have climbed the mountain to prepare himself in prayer. 'Brandon' is an Anglicisation of 'Breannán', the Irish language form of 'Brendan', from whom the mountain takes its present name. 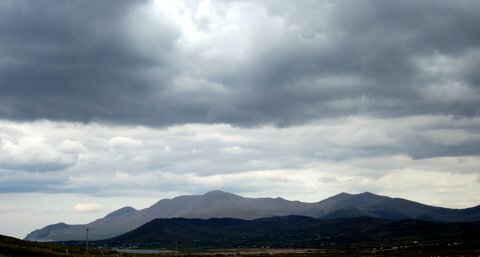 But its older name Slíabh Daghda, The Mountain of The Daghda, reveals its earlier association with the principal god of the ancient Celts. And the festivities that still take place each year on its summit celebrate the Celtic season of Lughnasa, traditionally associated with the sun god Lugh who rode the skies in his burnished chariot drawn by golden horses, and strode up The Daghda's mountain when the corn was ripe, to slay Crom Dubh with his spear of light and protect the harvest for his people. The festival of Lughnasa is still celebrated all over Ireland, with festivities taking place from late July through August. Its traditional dancing, feasting, bonfires, competitions and music-making easily lending themselves to recreation as arts festivals and tourist attractions: and its association with Lugh makes it easily marketable via the play, and especially the film version, of Brian Friel's Dancing at Lughnasa. But over the years, and in different places, there have been different versions of Lugh’s story. In some versions it's Crom Dubh, not Lugh, who brings the harvest out of darkness to the people. In Cloghane, Crom Dubh's image, preserved in the local church, was said to have brought luck and healing. The festival held in Cloghane village at Lughnasa is still called Domhnach Chruim Dhuibh, which means ‘Crom Dubh’s Sunday. And throughout Corca Dhuibhne, when old people insist they’re right about something, you still hear them saying ‘Dar Chruim’. Once I asked an old man to translate that for me, and he stopped for a bit, looking puzzled. Then he said he supposed it meant ‘by God’. He was right. It means ‘by Crom’. So, just as pagan gods were displaced by Christian saints, stories about older pagan gods must have been reshaped and retold to make incoming gods more important. Perhaps Lugh defeating Crom is an echo of ancient propaganda, as well as an image of light defeating darkness. ‘Our big sun god beat your crooked dark guy.’ If it is, the propaganda failed. Both stories survived. 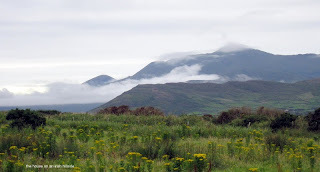 The festival of Lughnasa celebrates Lugh’s triumph over Crom Dubh. But in Cloghane, where it's traditionally celebrated over the last weekend in July, it’s still Crom Dubh’s day. And if you ask people why, they’ll tell you that’s just how it is. They’re aware of the contradictions and they’re not fazed by them. To them, what matters is what’s there, because it’s part of the picture. You pass on what you’ve received because it’s your children’s inheritance. What they do with it is up to themselves. All that is required of them is to pass it on in their turn, remembering that no story is unimportant because each sheds light on the rest. And that's why the end to my story here is so terrible. 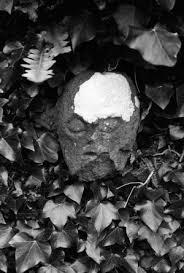 In August 1993, the stone head that the people of Cloghane had preserved so long was stolen from its place high up in the village church wall. It has never been returned. What a shame it was stolen. Some people have no respect. It really is sad. I don't know whether I feel worse at the idea of it being sold to a collector or thrown somewhere by vandals who didn't know what they'd taken. Either way, I tend to believe what the people of Cloghane say, that no luck will have gone with it. Some people just can't leave even the sacred alone. The greed and disrespect in our society is appalling. Oh for a change in consciousness. I think a change is coming, Bridget. Since writing The House on an Irish Hillside, I've been contacted via the book's FB page, by - and put in contact with - so many positive, responsible people with powerful, creative visions for the future. It's not that everyone has the same values or vision but there does seem to be a trend towards using the internet to link individuals who share a desire to educate, inform and create fora for courteous, respectful discussion. Do you know The Irish Way's FB page? That's just one example, but I mention it because I admire its administration and the immense amount of work that goes into it. Míle buíochas. Nach bocht an scéal é faoin ngadaíocht? Na deabhail, ní bheidh an t-ádh orthu!